Shorebird migration through South Carolina has been well under way since the beginning of August as was evident after David McLean's Bulls Island waterfowl/shorebird survey on August 4th. A large number of shorebirds have begun to show up again on our beaches. It seems like there are always a few stragglers, but nesting season is practically over and shorebirds are migrating south once again. 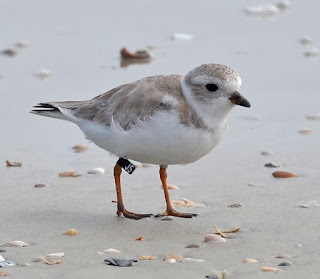 While this is a difficult time to correctly identify birds due to the high numbers of new fledglings and the majority of shorebirds in non-breeding plumage, it is also an exciting time of year because a large number of banded birds come through South Carolina! Spotting colored auxiliary bands such as engraved flags or color combinations on shorebirds adds a whole new level of fun to birding. We can learn a lot from banding projects about survival, migration, faithfulness to nest sites and mates, and local movements. This valuable information helps inform land managers and lawmakers on how to manage land used by endangered or threatened birds. So if you see a color banded shorebird, try to read the code noting the information listed here. Piping Plover in non-breeding plumage spotted in Rattlesnake Key, FL by Pat Leary. Can you read the yellow flag? Piping Plover in Breeding Plumage from allaboutbirds.org. 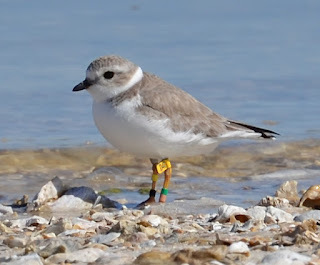 One species in particular that you are likely to see individuals with color bands on is the Piping Plover. Although it is a more difficult bird to re-sight due to the size of their flag, Piping Plovers are a treat to spot. There are three breeding populations of Piping Plovers in North America: a Great Lakes population, which is federally endangered, an Atlantic Coast population, and a Northern Great Plains population, which are both threatened. South Carolina’s inlets and barrier beaches provide great habitat for a number of Piping Plovers. Some only stopover on their way further south, but a good amount stay here for the winter and take advantage of mudflats at low tides and intertidal zones that are rich in insects and small aquatic invertebrates. This is a difficult bird to identify and re-sight a band. Similar in appearance to other plovers, the field marks that help me most often in identifying Piping Plovers is their overall gray bodies paired with yellow legs. In breeding plumages it is easier to discern plovers, but this time of year most birds are no longer flaunting their best spring and summer colors. Piping Plovers are banded on the breeding grounds and over the winter, but detecting color bands on these birds can be difficult due to their small size. Re-sighting requires good optics and a lot of patience. If you do get a good look at a Piping Plover, you can report Piping Plover bands by emailing vt.plover@gmail.com. For all you photographers out there, cameras with a good zoom lens are invaluable during re-sighting because you can capture a picture of the color bands without disturbing the birds. Although small, these birds are not to be underestimated. Intruders near a Piping Plover nest have a lot coming to them. We don’t see these birds during the breeding season, but from late April through early June both males and females engage in territory defense. They can be seen walking shoulder to shoulder with Plovers from adjacent territories bobbing their heads up and down to puff up and flaunt their back feathers. They will also charge at other birds, using their beak as a weapon. One observer in Manitoba reported a Killdeer entering a Piping Plover territory where it was bitten so hard on the leg that it limped for the rest of the summer. Around this time of year though when we see them in SC, they become more communal and will spend most of their time feeding in large groups with other shorebirds. What some find most fascinating is the large range Piping Plovers can be seen during the winter. Scattered all across the East coast, during the winter, these birds have been seen as far north as Long Island, New York and as far south as the Bahamas. Perhaps some have a greater taste for tropical bugs and will travel all the way to Puerto Rico for the winter. The huge feat that is migration and selection of nesting and wintering grounds are topics of research all along the coast. Another banded Piping Plover. Courtesy of Pat Leary. If you take anything away from this newsletter it should be this! It holds true for both migratory Piping Plovers and those which choose to overwinter here, that too many disturbances can be deadly. Sharing the beach with these cool birds is important for their survival. Piping Plovers burn a lot of energy every time they lift off to fly; energy they are trying to store for the winter or to continue migrating south. It takes a lot of work to maintain a healthy temperature during colder months and to be vigilant against predators. It’s interesting to think about how well a person would survive in their position. Imagine you are taking a long car trip across the country, or running a very long distance, but every time you stopped to rest or eat, someone scared you away. I certainly would not survive very long. There are other shorebird species out there that have color markers, or engraved bands or flags, such as Red Knots and American Oystercatchers, so keep your eyes out for them! Reporting re-sighted birds is a fun and educational experience and usually you can learn where else that bird has been re-sighted all over the world. Color banded shorebirds can be reported to www.bandedbirds.org which has an ongoing database where the public can input information about banded birds they have seen. This valuable information adds significantly to a greater understanding of the critical habitat needs of different species throughout their migratory routes. By participating as a citizen scientist and reporting the bands you see, you are doing a great service! But always keep in mind that we don’t want to love these birds to death. It is important to not flush or alter the behavior of a bird in order to read its bands. Thanks for reading and have fun re-sighting! Have questions, comments, cool stories you want to share? Emailnschillerstrom@audubon.org for more information.